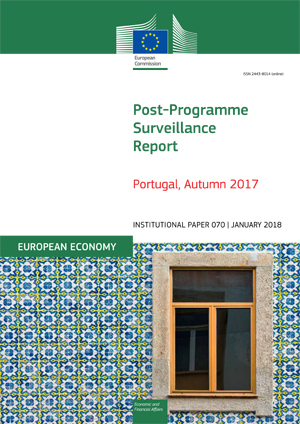 This report by the European Commission presents the findings of the seventh post-programme surveillance mission to Portugal and identifies remaining challenges for the Portuguese economy. Institutional Paper 070. January 2018. Brussels. PDF. 52pp. Tab. Graph. Bibliogr. Free. European Economy Institutional Papers are important reports analysing the economic situation and economic developments prepared by the European Commission's Directorate-General for Economic and Financial Affairs, which serve to underpin economic policy-making by the European Commission, the Council of the European Union and the European Parliament. Views expressed in unofficial documents do not necessarily represent the views of the European Commission.